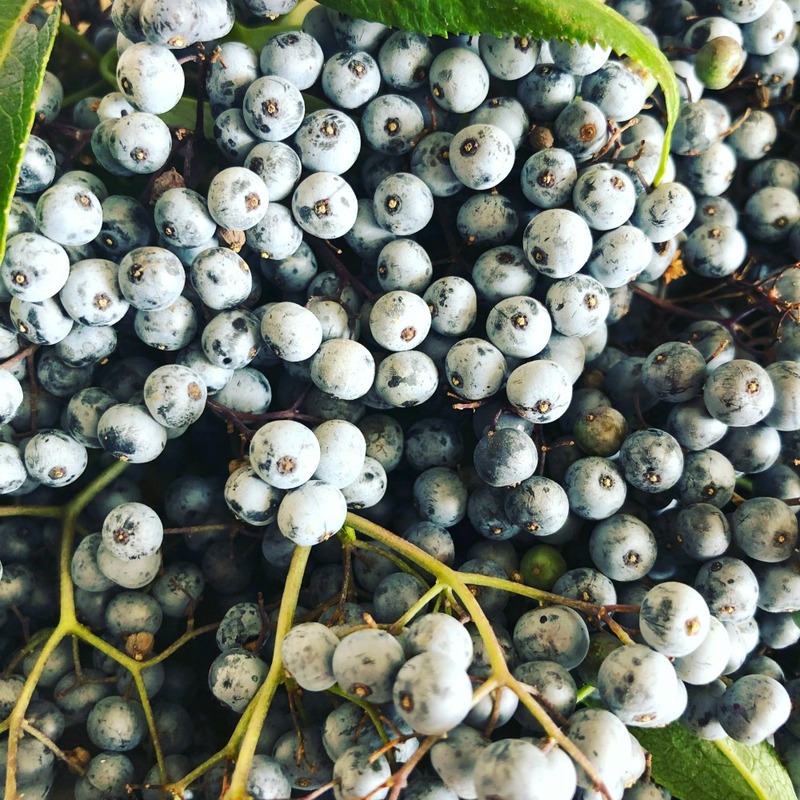 This article is all about: How to identify elderberry plants, how to forage and clean elder berries and flowers, the benefits of using elderberries to boost the immune system, and the BEST elderberry syrup recipe you'll ever taste! I am THRILLED this late summer day! I just harvested my second bunch of elderberries off a giant tree growing down the hill. Why am I so darned excited? Well, elderberries are known for and clinically proven to be an immune boosting herb extraordinaire! Plus, you can make all kinds of delicious things with elderberries and elder flowers. Syrups, oxymels, jelly, tinctures, teas, fritters, and more! Being new to this area of the country, I am so excited to see my old friend, Elderberry, growing wild here. When I was a kid, my dad and mom took us up to Mount Charleston (then, about an hour away from Las Vegas) to hike up the high altitude rocky trails every late summer to forage for elderberries. The elderberry bushes that grow in the desert there are not very big. They are more like shrubs. That's why I was so confused the first time I saw an actual elderberry TREE a few months ago, here in the wild in Idaho! That tree was about 20-30 feet tall! And filled with flowers at the time! Whoa! Those elderberries!!!! I did an actual Happy Dance when I saw that wild tree growing by the road down our hill! I harvested the flowers in the spring, but made sure to leave enough for the berries I knew would be coming ripe right around Labor Day. I was not disappointed. This species of elderberry are the west coast blue ones (Sambucus cerulea), and like the black elderberries (Sambucus nigra) found mainly back east, they have some supreme medicinal powers. There is another variety, a red type (Sambucus racemosa), and those you'll definitely want to avoid, as they are very toxic unless prepared properly. Here are some Blue Elderberries. The whitish powder on the surface is actually wild yeast, and will be helpful later on in making fermented products. But for the syrup, it's not needed. These will get a good rinse! The berries grow in clusters. You'll love my Complete Cold & Flu Care eBook! It's 65 pages of herbal information, remedies & natural recipes. I have to admit: I have searched for many years (in Southern Nevada) to find local elderberries living in the wild. They are not very tree-like in the desert where I came from. Because the plants here in Idaho are so BIG, a friend of mine actually pointed one out to me one day in early spring. Finally---a wild elderberry plant (er---tree)! And here is how you can identify an elderberry bush or tree, in case you find one (or more) in your area. If you plan to harvest elder flowers or berries, you need to know what to look for. There are species of toxic plants that are similar, and you don't want to make any mistakes. You can find out 15 Foraging Tips for Medicinal and Edible Plants right here. The leaves of the elderberry are compound, with 5 to 11 (odd numbered) opposite leaves on a thin stem. The leaflets have serrated edges and are pointed at the tips, with a rounded bottom. Leaflets are in a lance shape. Because there is an odd number of leaves on a stem with opposite leaves, there is always a terminal leaflet at the end of the stem. It's a very distinct leaf pattern, and once you know it well, you'll know if you are looking at an elderberry bush or tree, even if there are no flowers or berries on it. Water Hemlock: A toxic look alike. One thing to absolutely take note of in identifying elderberry are the leaves, as stated above. The flowers of the water hemlock are similar, so taking a look at the leaves for proper identification is a good idea. The leaves of the water hemlock are arranged alternatively as opposed to opposite. So that's a big giveaway! Here are the leaves of a very mature Elder tree. The flowers are in the form of an umbrel (umbrella shape). They form in clusters of tiny white or cream colored flowers. From afar, they look like a big, beautiful white flower; but as you get close to it, you'll see sweet tiny flowers with a delicious scent. Well, once you've identified the plant and the flowers, you'll know the berries are not far behind! Just keep your eye on that plant, and you'll see them begin to emerge in mid-summer and ripen in late summer. The blue elderberries have a whitish coating on them, which is wild yeast. If you rub it off, you'll see the dark blue of the berry underneath. 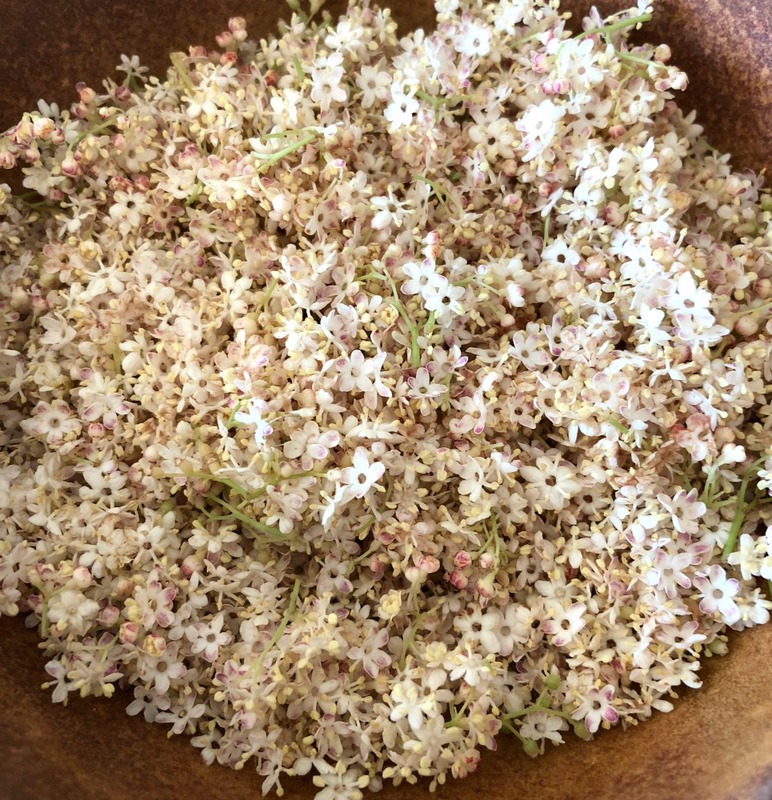 That wild yeast is what makes it a wonderful berry to use in making fermented products like vinegar, mead, wine, etc..
Elder flowers grow in clusters. The tiny white or cream colored flowers form an umbrel (umbrella shape) and have a lovely scent. 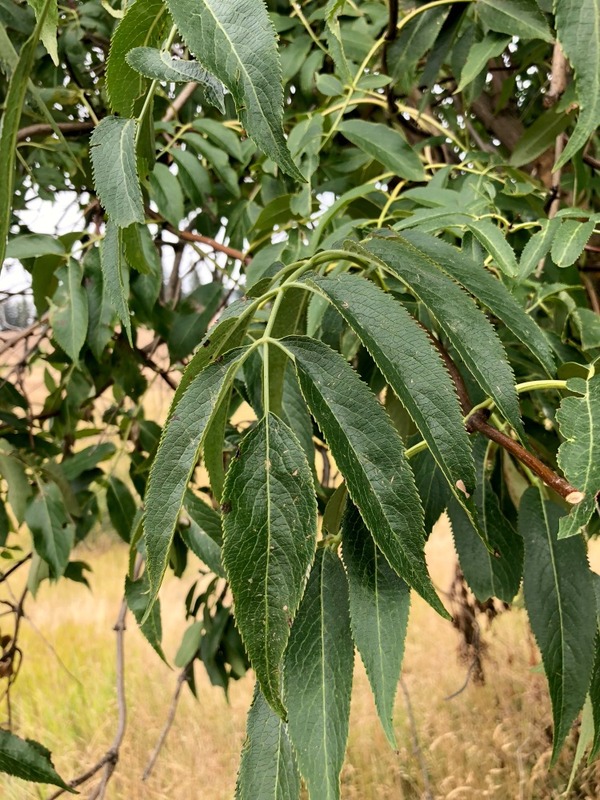 The plant itself can range from being a lower-growing bush or shrub (like the ones I gathered from as a child) or a very tall tree with bark and woody stems (like the ones I'm now seeing everywhere here in Idaho). Perhaps you've heard elderberries aren't safe to use. Well, there are certain precautions to be aware of, but once you know how to prepare your elderberries safely, you'll have no worries! The stems and branches, as well as the roots of the elderberry tree/bush are slightly toxic, as they contain cyanic compounds. The green berries also contain compounds that are slightly toxic as well. Therefore, when harvesting the flowers, try to get as many of the small stems out as you can. A few left in are ok, but do your best. With the berries, be sure to pick out any green ones, as these aren't good for you. Also, like with the flowers, try to get as many of the small stems off as possible. So, can you eat wild, raw elderberries? A few won't hurt you, but too many can give you a really good stomach ache and possibly nausea. Not the most pleasant thing. Cooked elderberries, on the other hand, are perfectly safe! Here are some flowers I picked last spring to make a fresh tincture from. We will use the tincture to help fight off any illnesses that come our way this winter! Guess what? There's been quite a bit of scientific research around the benefits and efficacy of elderberry for prevention and to speed recovery. One study found elderberry was excellent at inhibiting a number of viruses in vitro. Another study found it had a significant effect on the swine flu virus. And yet another research study found it reduced the symptoms of a number of strains of flu. 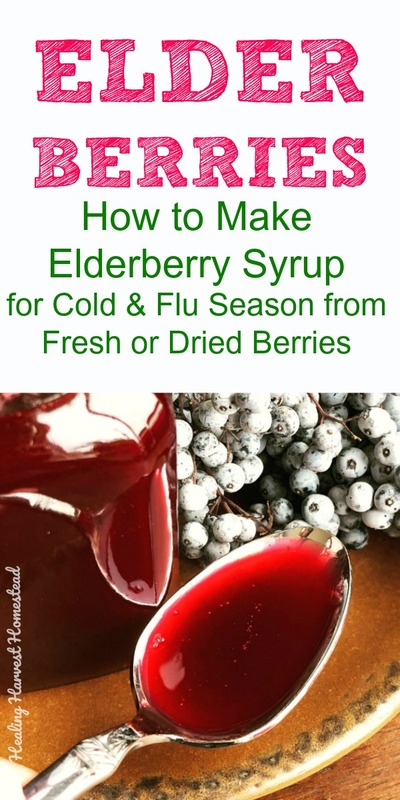 I've written more about elderberry in my eBook: How to Be Healthy: Natural Cold & Flu Care, and also in this article, Herbs to Use Right Away if You Feel a Cold or Flu Coming On. 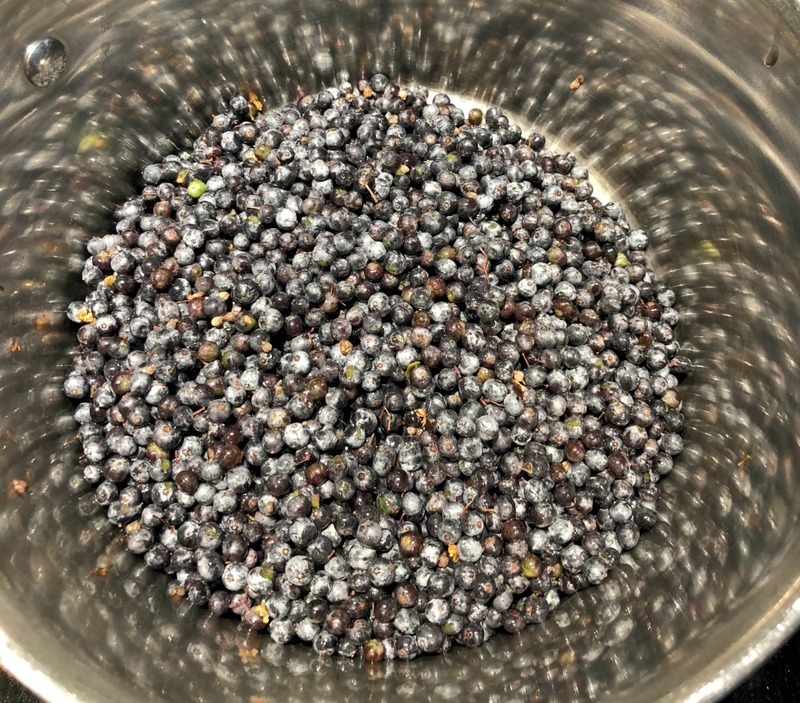 Here is a good quart or so of fresh elderberries, all cleaned and ready to cook into a medicinal syrup that is delicious! There are a couple green ones I'll need to pick out of there. It's important to remove the stems, at least as many as you can. What I do is take my berries out of the basket and wipe my hands along the stem so they fall into a strainer. The ripe berries will come right off, while less ripe ones may need a little tugging. Green ones--just toss into the compost. Don't worry if a few get in there, but it is best (in my opinion) to get as many off as you can. Then I rinse the berries well while they are in the strainer. It's a bit of a tedious process, but well worth the effort. After the rinse, they are ready to dehydrate or freeze for later use, or you can go ahead and get that elderberry syrup or oxymel made! Don't Want to Forage for Elderberries? Not a problem! You can order high quality dried elderberries from Starwest Botanicals, my favorite place to purchase bulk herbs, spices, and essential oils. Mountain Rose is another good company, but I have found their prices are higher and shipping is slower. Both companies do a good job with sustainability. Keep in mind that if you are working with dried elderberries, these are considered raw and should be prepared (cooked) just like fresh elderberries. 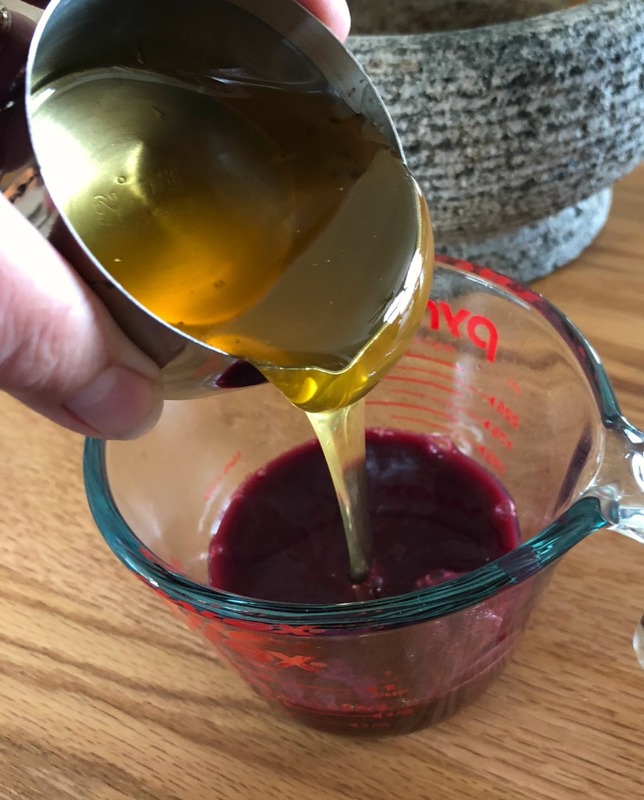 This recipe will make between one and two cups of elderberry syrup, depending on how thick you want it and how much honey you add. I tend to reduce the water quite a bit for more concentration and not add as much honey as most people like. With this batch, I yielded one cup and a little more of very concentrated, slightly sweet elderberry syrup. Feel free to make adjustments! *** Raw honey, local is best. This is Step 3, below. I've already created the juice, and now the ginger and spices are simmering away, while the liquid reduces a bit more. In a large soup pot, add the elderberries and 1/4 to 1/2 cup water. Bring to a boil, then reduce the heat and simmer until the berries are nice and soft, even on the mushy side. The liquid will reduce some. It's ok to add more water if you need to. Strain out the elderberries and mash, leaving the liquid behind. Measure the liquid---this will be approximately the amount of honey you'll add. Place the liquid back in the pot with the ginger and ground spices. I poured a bit more water in because my elderberry reduction was quite thick. (I tend to over-reduce it.) This is a good thing in general, because it's more concentrated, but I still needed to simmer the spices in the liquid for about 15 minutes---therefore, I needed more water. Don't worry. It will boil off. Once it's simmered for around 15 minutes, allowing the medicinal properties and flavors of the spices to infuse into the juice, remove and strain off the spices. You may end up with some ground cinnamon and clove in your syrup, but this just adds to the flavor. If you don't want this, use a very fine strainer. You'll want to be sure your syrup is cooled a bit before pouring the raw honey in. Isn't that the most gorgeous colored honey? We got it from a bee keeper in our area. Lovely! Your liquid will still be warm at this point, but not boiling. If it's really hot, let it cool down to around body temperature (not higher than 115 degrees) because you want to keep the active beneficial enzymes and antibacterial properties of the honey alive. Now go ahead and add your honey. You can add up to equal amounts honey and liquid, but I prefer a much lower amount of sugar. I had one cup liquid above in step 2. So I planned on adding 1/2 cup honey. You can add more to taste, though. Stir well until the honey is fully dissolved. Bottle up your syrup! Enjoy! NOTE: You can also add some Echinacea root or other herbs to enhance the medicinal qualities even more if you like! You can use dried elderberries to make this syrup too. Just use 1/2 quart of the dried berries and one full quart of water, as the berries will reconstitute. Simmer until the liquid is halved, add your ginger, any other herbs, and spices. Then, just finish up as in the above. You should be able to mash those berries once they are re-hydrated. You can add more water as you go along, if you need to also. Yum! 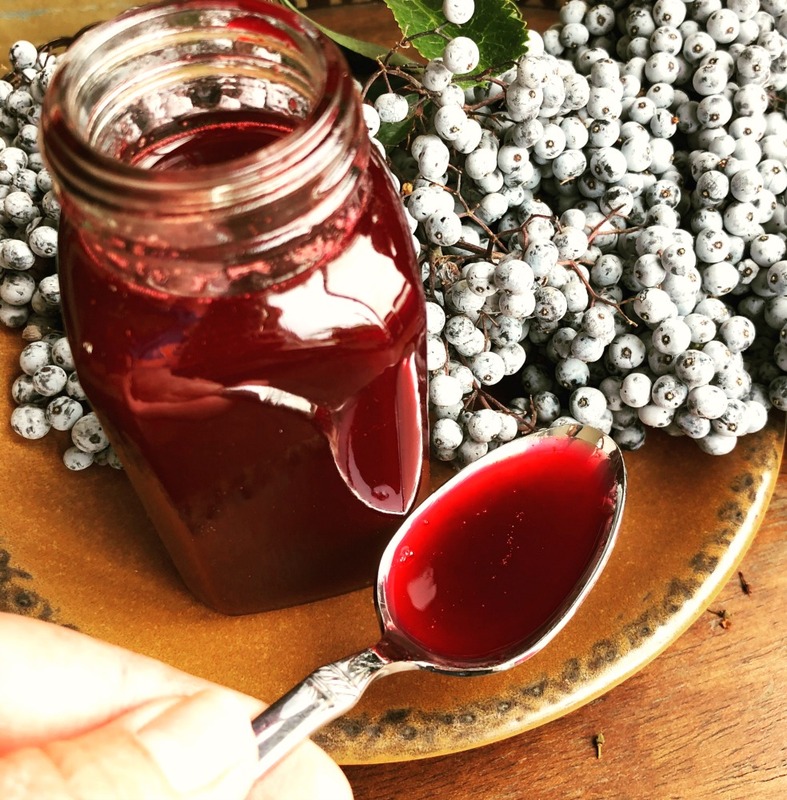 Elderberry syrup is not only delicious, it's just gorgeous! How Long Will Your Homemade Elderberry Syrup Last? At room temperature, it will last a good week, perhaps longer. In the refrigerator, it will be safe for around two weeks. The honey adds some preservative action to the syrup. I have a confession to make, though I don't recommend this: I once had some elderberry syrup tucked away in my refrigerator, and I still used it a year later. Follow your nose and your intuition. But if in doubt, toss it out! What if You Don't Want to Make Your Own Elderberry Syrup? Really, you can use as much as you like. Especially if you are drizzling it over pancakes, you'll be using a quantity. Just keep in mind that some people have a bit of a laxative reaction if too much is used. For medicinal purposes, it's great to take a tablespoon a few times a day if you feel a cold or flu getting started. You can also take it as a daily tonic for health and prevention of cold and flu, too. It's an absolutely delicious herbal syrup! **NOTE: For infants under a year, do not use elderberry syrup made with honey. I have heard you can substitute with date sugar, and I'm sure organic cane sugar is fine too. Also, for using this with young children, you'll want to cut back on the amount you give them. A slightly different view. I love this color, don't you? 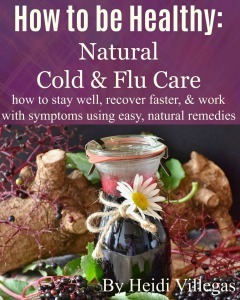 Take a look at my Complete Cold & Flu Care eBook! It's 65 pages of helpful herbal information, natural remedies, & recipes to keep you well and get you better faster! This is one of my favorite herbs in the wild. I just love elderberry. From the Spring time with the lovely flowers to the late Summer with its blue or black berries, it's such a useful plant! And it's pretty too. What about you? 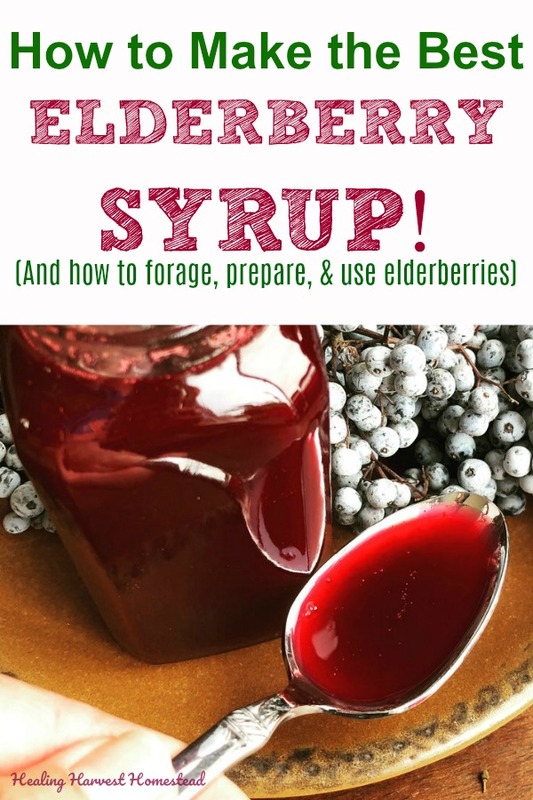 Have you made elderberry syrup before? Or other elderberry products, like oxymels or tinctures? I'd love to hear your questions, comments, and experiences, so go ahead and leave a comment in the comments section below! OH! And if you are interested at all in learning more about using herbs for your health, The Herbal Academy of New England has many excellent courses for every level and topic! I've loved learning from this online school. **And lots more on the blog! P.S. I hope you'll sign up for the weekly newsletter! You'll never miss a thing, and I'll have free tips for you every time. Plus, You’ll get immediate access to the Resource Library! You’ll love what’s inside! And…it’s updated weekly! Disclaimer: I am not a medical doctor or professional. In no manner, stated or implied, is any statement in this article or in any other of my publications/videos/podcasts, etc., meant to treat, cure, diagnose, or prevent any disease. Please seek medical attention from your professional if you have questions or if you are taking medications. These statements have not been evaluated by the FDA.